Porcelain veneers can erase any number of cosmetic imperfections. They’re thin sheets of dental porcelain that are affixed to the surface of the teeth that show when you smile. Dr. Bannan remakes smiles with porcelain veneers in South Daytona. Virtually any cosmetic imperfection in the front teeth can be resolved with porcelain veneers. From chips and cracks to stains and teeth that appear too short or pointy, veneers provide an almost instant smile do-over. But remember that veneers are reserved for making cosmetic improvements to the front of the smile. For teeth that are worn, weak, decayed, or otherwise flawed, a dental crown will likely be the best option. Your dentist can help you understand which is best for you. Most people who wish to make big improvements to the appearance of their front teeth are suitable candidates for porcelain veneers. Patients should be over the age of 18 and in good oral and overall health to undergo the procedure. First, you’ll have a checkup and cleaning with the team at Water’s Edge Dental to prepare your teeth and gums for porcelain veneers. The advantages of choosing porcelain veneers are numerous. First, any number of flaws are fixed in one treatment, saving you time, stress, and multiple visits to the dentist. Porcelain veneers are also a highly natural-looking solution that produces dramatic results. Cared for properly, veneers can last for years and years to come. And the benefits of a confident, beautiful, long-lasting smile? Those are endless. 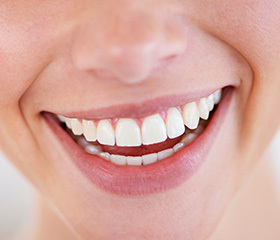 Veneers are completed over two to three visits to our office. First, you and Dr. Bannan will thoroughly discuss your smile goals to help you understand what’s possible with your treatment. Teeth look the most natural when they match the whites of your eyes -- but decisions on the shade, shape, and overall appearance of your veneers are left up to you. Based on your desires, Dr. Bannan will put together your treatment plan and then prepare your teeth for the new veneers. Tooth preparation includes removing a small amount of enamel from the surface of each tooth. Reshaping helps the veneers lie flat with the rest of the teeth. You leave the first appointment with temporary veneers. In the time between visits, your veneers are expertly crafted in a dental lab. You will return to our office for their final placement after a couple of weeks. Dr. Bannan will check to make sure the veneers look, fit, and function just like they should. Then he’ll give you a preview of your new smile. Once you’ve given your final OK, the veneers are bonded onto the surface of the teeth. The maintenance for dental veneers simply requires brushing, flossing, and regular visits to the dentist’s office. Use of a regular, non-abrasive toothpaste is sufficient for cleaning veneers. Dental porcelain is highly resistant to stains, so teeth whitening products are not necessary with veneers. People who grind their teeth at night or play contact sports should invest in a custom-fit mouthguard to protect the veneers from heavy impact. 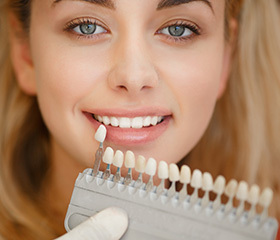 Are you interested in giving your smile a makeover with dental veneers? Contact Water’s Edge Dental to schedule an appointment with Dr. Bannan, your dentist in South Daytona, today.